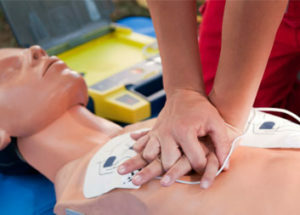 their skills in cardiac arrest situations. 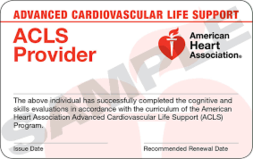 Program Description: Upon completion of this class, the participant will understand and be able to manage cardio respiratory emergencies by using the systematic ACLS guidelines of the American Heart Association, (AHA). You will know how to evaluate and manage a sudden adult respiratory arrest, VF/VT arrest, asystole, pulse less electrical activity, bradycardia, stable and unstable tachycardia, acute coronary syndromes and acute stroke. Please see shopping cart for cost.